Peel and finely chop enough onion to measure ½ cup [1 cup]. Thinly slice the remaining onion for pickling. In a medium sauce pot over medium heat, warm 1 to 2 tablespoons oil until hot but not smoking. Add the chopped onion, season with salt and pepper, and cook, stirring occasionally, until starting to soften, 2 to 3 minutes. Stir in the quinoa and cook until fragrant, about 1 minute. Add 1 cup [2 cups] water and season generously with salt and pepper. Bring to a boil, reduce to a simmer, cover, and cook until the quinoa is tender and the water is absorbed, 15 to 20 minutes. Fluff with a fork. While the quinoa cooks, prepare the remaining ingredients. In a medium bowl, combine the sliced onion and apple cider vinegar. Season with salt and pepper and toss to coat. Let stand, stirring occasionally, while you prepare the rest of the meal. Cut the olives in half lengthwise, checking for any pits. To the pot with the cooked quinoa, stir in the chickpeas, tomatoes, olives, and kale; season to taste with salt and pepper. 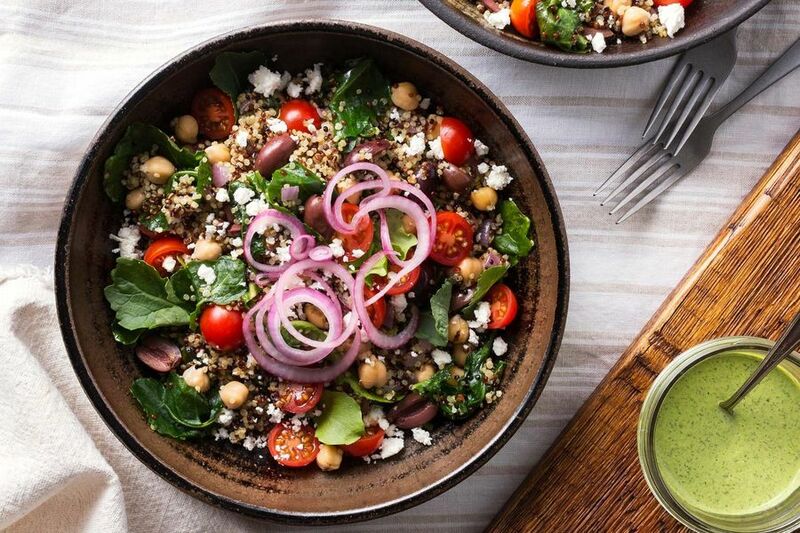 Transfer the quinoa and chickpea pilaf to individual bowls. Top with half the tahini goddess dressing and as much pickled onion as you like and sprinkle with the feta. Serve the remaining dressing on the side. Top with the dressing, onion, and feta. Developed by one of our Sun Basket Test Kitchen team mamas, this kid-friendly Mediterranean-inspired dish lets any parent get dinner on the table in about 20 minutes. If you have any quick-pickled onions left over, cover and refrigerate them for up to 1 week. They make a great garnish for salads, sandwiches, eggs, and grain bowls. Calories: 550, Protein: 18g (36% DV), Fiber: 9g (36% DV), Total Fat: 24g (37% DV), Monounsaturated Fat: 28g, Polyunsaturated Fat: 6g, Saturated Fat: 5g (25% DV), Cholesterol: 20mg (7% DV), Sodium: 770mg (32% DV), Carbohydrates: 65g (22% DV), Total Sugars: 6g, Added Sugars: 0g (0% DV).